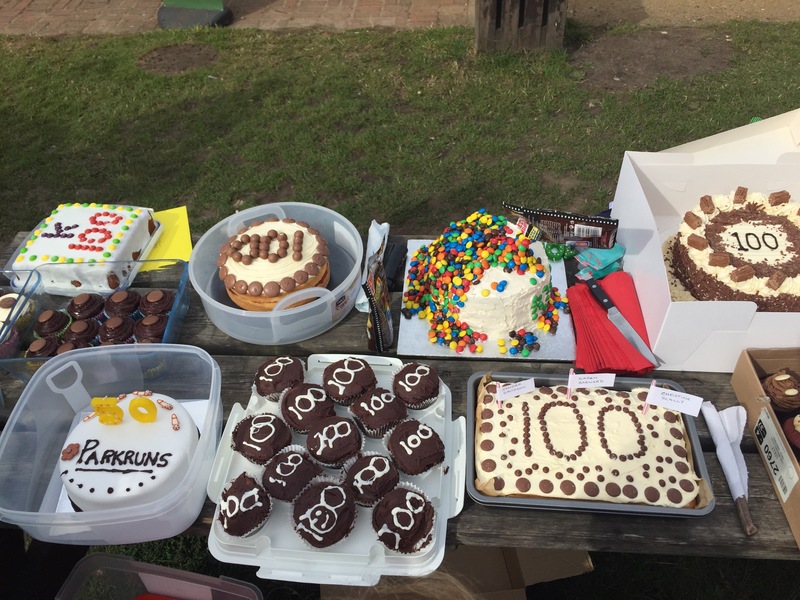 If you’re familiar with parkrun, then you should know how much cake plays a part in celebrating parkrun milestones. 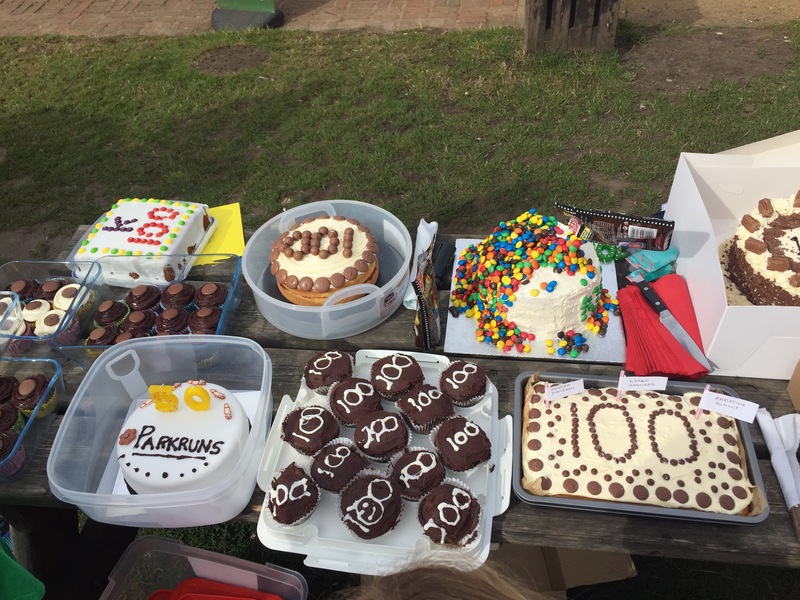 Actually, there doesn’t even have to be a milestone. 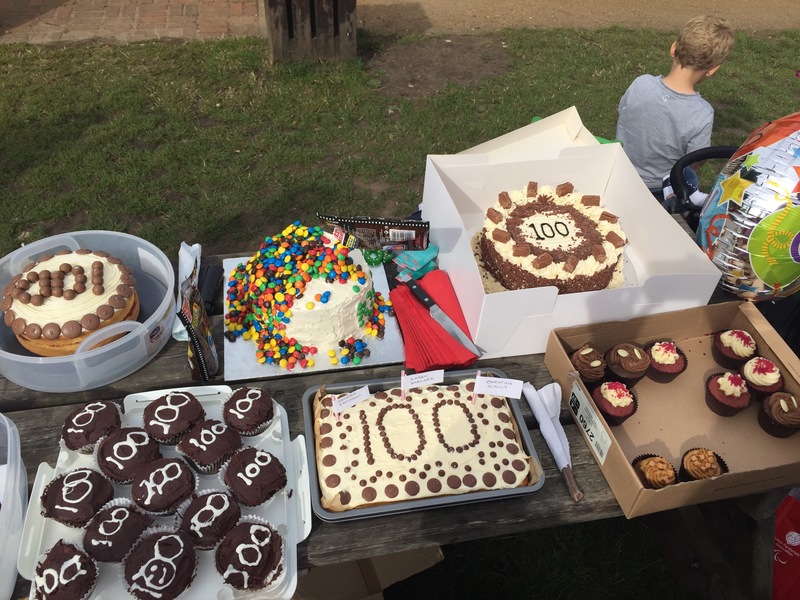 As fit as they are, parkrunners seem to love nothing more than rounding off 5k on a Saturday morning with some kind of sugary treat. Many, many big bags of M&Ms. I couldn’t tell you how many exactly we used, but I’d imagine in the region of 8 or 9. 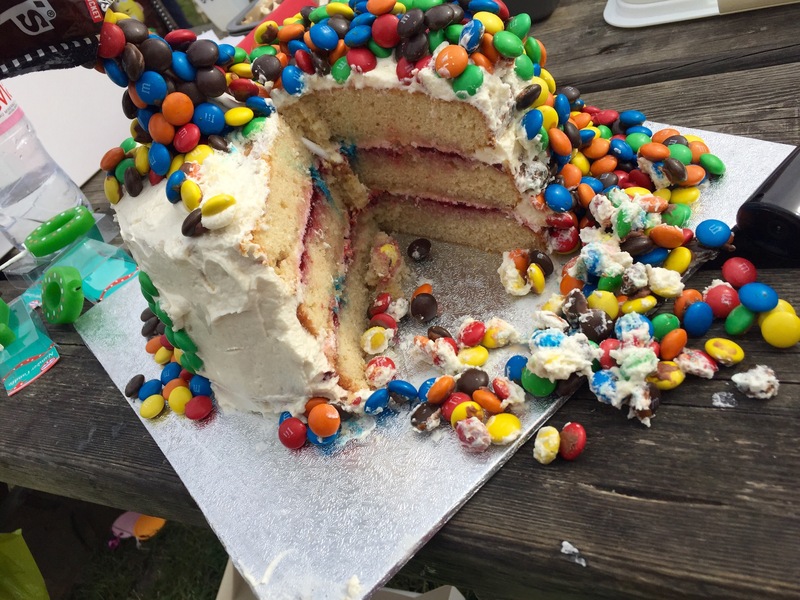 It’s also a good idea to take a spare bag with you for any hungry/curious children (or adults for that matter) to stop them from picking off the M&Ms before the cake is cut. 4 cake pop sticks for the ‘gravity-defying’ part. Kebab sticks or a cardboard toilet/kitchen roll would also work well. 1. For the sponge layers, preheat the oven to 180C/160C (Fan)/ 350F/Gas 4. 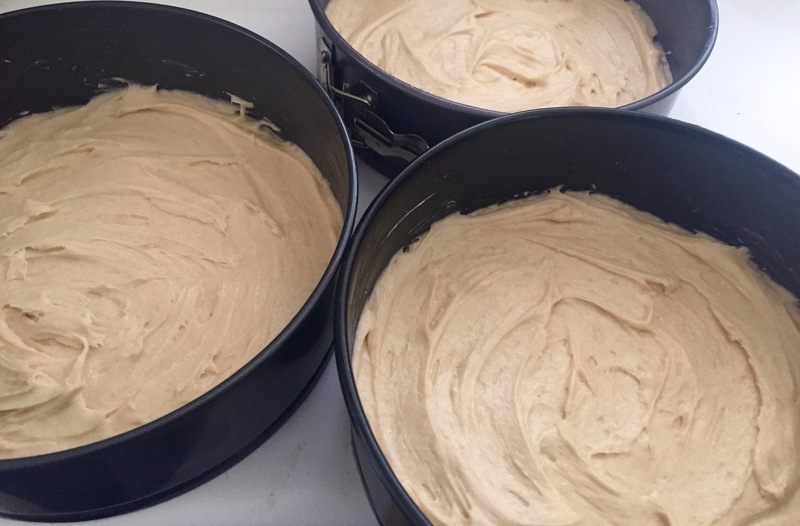 Grease and line the base of three 18cm/7in cake tins with baking paper. 2. Cream the butter and sugar together in a bowl until pale and fluffy. Beat in the eggs, a little at a time, and stir in the vanilla extract. Fold in the flour using a large metal spoon, adding a little extra milk if necessary. 3. Spoon the cake mixtures into the three cake tins and gently spread out with a spatula. Bake for 20-25 minutes, or until golden-brown on top and a skewer inserted into the middle comes out clean. The mixture tastes amazing, by the way. 4. Remove from the oven and set aside for five minutes, then remove from the tin and peel off the paper. Place onto a wire rack to cool completely. 5. For the frosting, fill a large bowl with cold water. Pour 100ml/3½fl oz water into a pan and add 250g/9oz caster sugar. Heat gently and stir until the sugar dissolves, then bring the mixture to the boil. Use a damp pastry brush to wash down any sugar crystals on the side of the pan. Boil the mixture rapidly, without stirring it, until it reaches 121C/250F (use a kitchen thermometer for this). 6. Preferably using a freestanding mixer, whisk the egg whites until stiff. Start this when the sugar temperature of the syrup gets to about 100C. Gradually whisk in the remaining caster sugar. 7. As soon as the syrup reaches 121C/250F, plunge the base of the pan into the bowl of cold water, to prevent the syrup from getting any hotter. Only leave the pan in the water for a few seconds or the syrup will get too thick. 8. 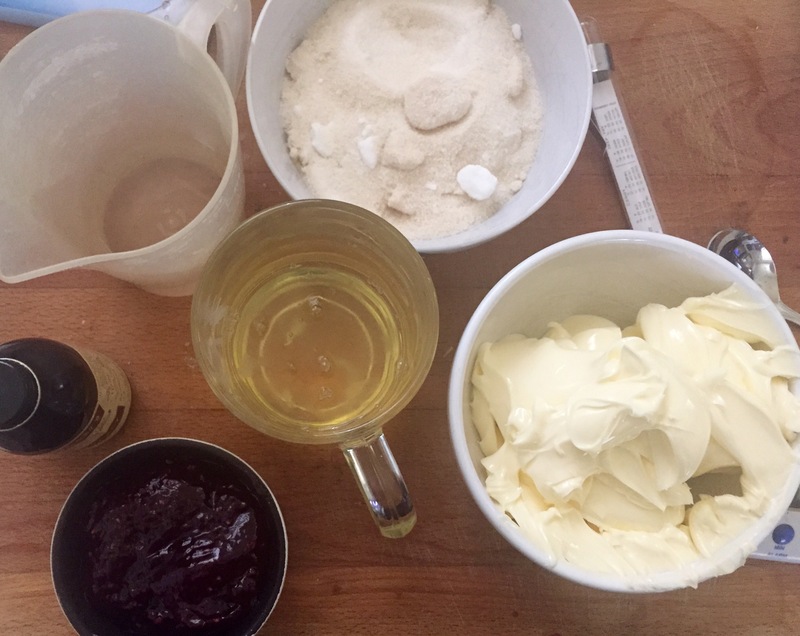 Switch the mixer on full speed and gradually pour in the syrup in a thin stream into the middle of the bowl, trying not to get any syrup onto the sides of the bowl or the whisk, as it will set there and won’t get mixed in properly. Continue whisking the mixture for about 8-10 minutes until the bowl feels just lukewarm. If the syrup starts to become too thick to pour, return the pan to the hob very briefly. 10. If the layers have risen a little too much in the middle, make sure to even them out by slicing off some of the cake with a knife. Spread the jam over two of the cake layers and top with a layer of frosting. 11.Sandwich the cakes together. Chill in the fridge for 15 minutes. Remove from the fridge, place on a cake board and gently cover the whole of the cake with the frosting. I bought this cake board from Amazon. 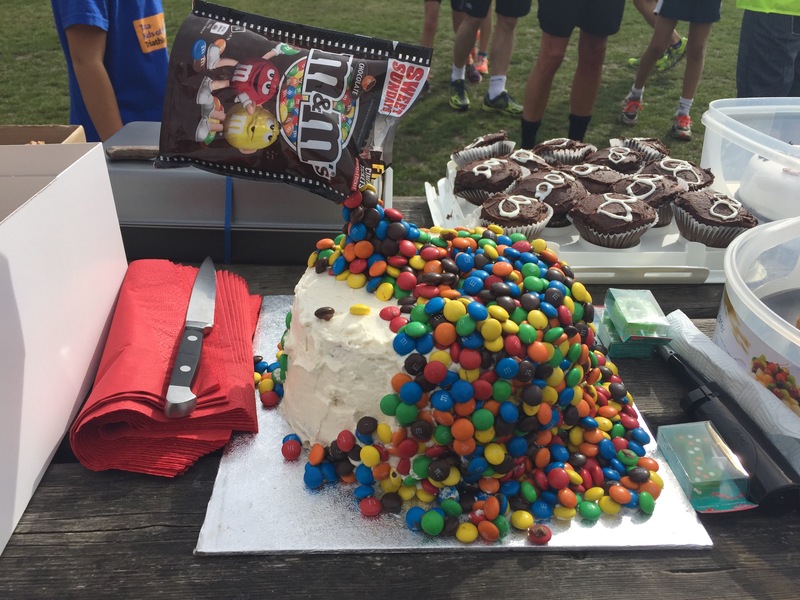 It’s just as well that my smoothing skills weren’t exactly refined, as some of the frosting which made its way onto the cake board served really well as a base to which to stick the cascading M&Ms. 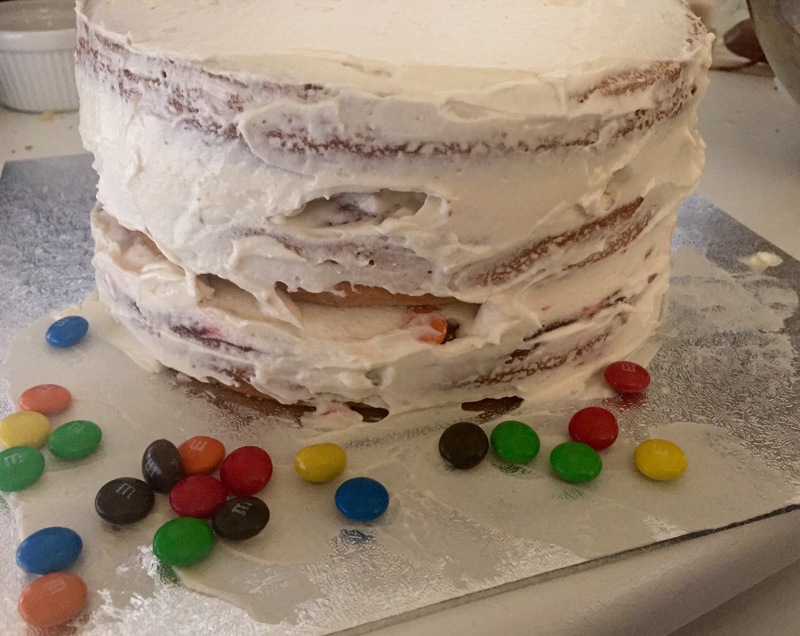 The next few hours were spent periodically popping the cake back into the fridge after gradually adding more frosting as I found that the M&Ms stuck better to the frosting itself when it was left to dry. This was relatively easy. As for the gravity-defying cake-pop-stick aspect, I sellotaped four together and stuck them into the top layer of the cake at a diagonal angle, as I preferred this to the vertical placement which I’d seen on many other of these cakes. Building up the M&Ms around the sticks was a bit tricky. I’d definitely recommend melting some of the chocolate and applying it to the sticks and leaving it to dry as it’s easier to stick the M&Ms onto the dried chocolate than straight onto the plastic. This stage really takes time and patience to apply each M&M onto the stick individually. I put a little bit of melted chocolate onto the back of each one before leaving it to dry for a few seconds and then pressing it onto the cake pop stick and leaving it again to dry before doing the next layer up. This was not only messy but a little demoralising when they just wouldn’t stick. Patience and perseverance are your best friends at this point! 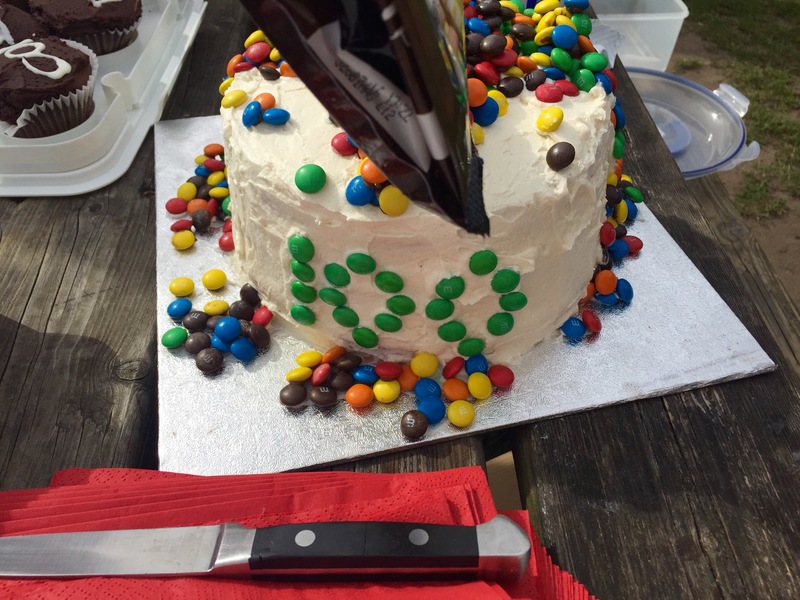 When I’d finally finished placing every M&M on the cake, I left it in the fridge overnight and ceremoniously put on the M&M bag in the morning. The bag is stuffed with some kitchen roll to make it look full while also keeping it light. Above and below you can see where the cake pop sticks are pushed into the cake. If you’re not cutting it yourself, it’s certainly worth letting the person who is know that the cake has inedible parts. 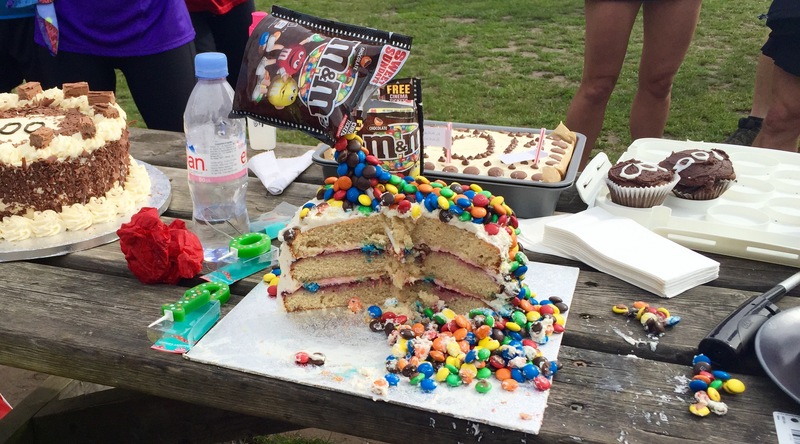 Cutting the cake was incredibly messy, but if anything this added to the fun of it, and children at parkrun seemed to love it. Do make sure you have plenty of napkins on hand! There are much easier ways of making this cake, such as by buying pre-made sponge and frosting, but this recipe worked out beautifully for a first attempt, and there’s a lovely sense of accomplishment knowing that you’ve made it from scratch. With time and patience on your side, this is absolutely achievable. If I can do it, I know you can, too.